Few actions we undertake on a daily basis are as dangerous as just plain driving a car. If the driver is distracted – by eating, grooming, talking on the phone, or texting – the risk of harm or death skyrockets. A study out of Virginia Tech shows that around eighty percent of all accidents happen as a result of some form of distracted driving, and that texting doubles the risk of an accident. But perhaps more powerful than numbers are the stories shared by those who know firsthand the horror of losing a loved one because a driver’s brain was not focused on the road. Survivors mourn the faces behind the statistics. Bound by unimaginable loss, these men, women, and children want the senseless deaths of their family members and friends to matter. 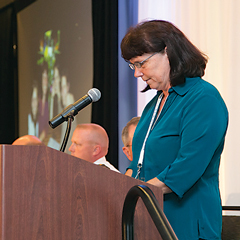 That’s why a few months back, a poised Patty Kruszewski of Henrico County faced more than 300 attendees at the Virginia Distracted Driving Summit and talked about her beloved daughter, Lanie, 24, who was killed by a man driving while texting on his cell phone. The driver, Elias Webb, who received a three-year sentence for his role in the hit and run, failed to see Lanie because “he was supposedly texting a friend a happy birthday message. Hard to escape the irony,” said Kruszewski, “that Webb’s overwhelming need to text a friend about a birthday caused my daughter’s death day.” She was just one of several speakers that day who shared the impact of distracted driving accidents on their lives and how their losses deepened their resolve to spotlight a deadly problem. The conference was organized by the nonprofit Drive Smart Virginia, a traffic safety advocacy organization. The event attracted industry leaders, scientists, safety advocates, educators, and law enforcement officers from across the state to exchange ideas, hear the latest research, and discuss ways to prevent distracted driving accidents by not only current drivers of all ages, but also with the next generation of drivers. Chairwoman of the National Transportation Safety Board Deborah A.P. 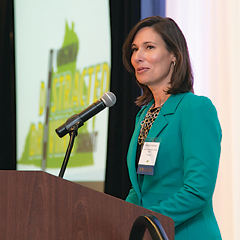 Hersman told attendees that distracted driving accidents are completely preventable. That’s one reason the NTSB is campaigning for a ban on the non-emergency use of smart phones and other portable electronic devices while driving. But many drivers reject a full ban, saying that hands-free devices are safe. Investigators have determined otherwise. Poor decisions and human error behind the wheel take a toll. In Virginia last year, 775 people were killed and more than 67,000 were injured in highway accidents, according to the state Department of Motor Vehicles. The economic cost of traffic crashes statewide was an estimated $3.3 billion in 2011, according to the National Safety Council. The impact of losing her youngest daughter, who coached at Maggie Walker Governor’s High School and had planned to go back to college to become a teacher, transformed Kruszewski. “I’ve gone overnight from being an optimistic, energetic person who got out of bed looking forward to each day, to someone who lives in a state of constant dread, drags herself through the day, and functions so poorly at work that I’ve had to drastically curtail my hours,” she said to an attentive audience. When she sees distracted drivers on the road, Kruszewski becomes enraged. “When I see drivers texting or talking on the phone, I want to light up a flashing sign on my car that says, ‘Put it down, [expletive]!’ I fantasize about taking out a blowgun and shooting darts into those drivers’ tires. I fantasize about pulling a lever in my car and popping a big iron claw out of my hood that snatches the phone out of their hand,” Kruszewski said. Webb suggested looking at the issue through a different lens. He said companies are held responsible if an employee who is distracted while driving injures someone during the scope of their employment. “So companies should create a policy and a culture to prevent this from happening,” he said. Patty Perutilli, whose husband, Fred, was struck by a texting driver after he stopped along the road to pick up something that had fallen off his truck, said drivers must practice common sense. Perutilli said she shares her story in the hopes of changing behavior. By speaking out “maybe a few drivers will get into their cars with an awareness that cars are not living rooms. They are tools, tools with the potential for tremendous destruction,” Kruszewski said. “And I can only hope that they will think of the other drivers, and cyclists, and pedestrians around us not as impediments in our path, but as people, people with faces, precious lives, and family and friends who love them. “You’d never close your eyes for five seconds and drive,” says Rob Richardson, public relations and outreach manager with Drive Smart Virginia. “Yet that’s what happens when you text behind the wheel.” On average, five seconds is how long texting takes your eyes off the road. Five seconds is all it takes to alter lives forever. Texting and driving takes your hands off the wheel, your eyes of the road, and your mind off the task of driving. That means texting and driving is a manual, visual, and cognitive distraction. While reports show drivers of all ages are texting and driving, many teen drivers on the road have grown up with the cell phones as a natural extension of their hand. “Traffic crashes are the leading cause of death for teens, and when it comes to distracted driving, teens are most likely to text and drive. When you’re distracted, you increase your chances for crashing,” says Richardson, the father of an 11-year-old. • Instruct your teen: When you get in the car, turn your phone off and put your seatbelt on. Seatbelts are the best defense against a distracted driver. • Teens should only talk on the phone in the car in the event of an emergency. Need to make a call? Pull into a parking lot. Or, if there’s a passenger in the car, the friend should make the call. • Out of sight, out of mind. If it’s too tough to keep your phone off, try putting it in a locked compartment. It’s less of a distraction if you can’t see it. • Absolutely no social media when driving. If you see something that would look great on Instagram, ask a passenger to take the picture and post it. 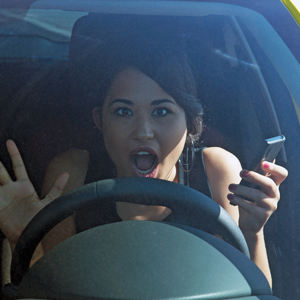 • Never text when driving – even at a stoplight or in traffic. While Richardson’s son isn’t driving yet, he says the tween has practiced plenty behind the wheel of a golf cart. Although preparing your teen to drive is always a good idea, the most important thing parents can do is to set a good example for future drivers. “Don’t talk on the phone and drive. Never text and drive either. Often teens tell us some of the bad driving habits they exhibit are habits they learned from their parents,” says Richardson.